Thol Lake Bird Sanctuary is a shallow freshwater body surrounded by marshes and scrubby forest on all sides. It is speckled with reed beds that gives it a distinct ambience, making it an ideal dwelling for various species of birds and insects. The agricultural land surrounding the lake is where the birds flock to for food; it’s overwhelming to see the birds flying together in the sky or the long-legged cranes with elongated necks stalking the lake for fishes and small insects. The serenity of the ambiance makes it an ideal home for birds; and there’re more than a hundred species of birds that fly out here, quickly making it a favourite among bird-watchers or ornithologists. Located 20km from Ahmedabad, the bird sanctuary is best visited in the early hours of the morning till early evening. You’ll get to spot everything from cranes, geese, flamingoes, pelicans, egrets, herons, spoonbills, to ducks and whistling teals among many other migratory birds that nest and breed in the lap of this natural exuberance. The most commonly spotted bird though is the Indian Saras Crane with its long bare legs, elongated head and red head, gracefully pecking insects while walking around the lake with dance-like movements. This bird is touted to be the tallest flying bird on earth, and is often seen in pairs. Between the months of November and February, a drive down to the Thol Lake is the best way to get away from the maddening rush of city life. On your way to the lake, keep an eye out for the variety of birds which populate the pools and canals on the way. If you’re into avian photography; this the drive and the sanctuary to be a complete delight. 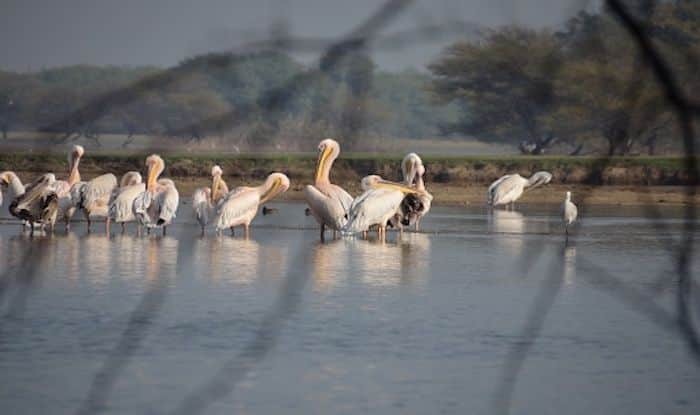 Keep one full day for exploring the Thol Lake Bird Sanctuary for maximum immersion in the experience.